Monuments Of Egypt: Perhaps the most famous of all the Ancient Egyptian monuments, the Sphinx and the Great Pyramids at Giza have come to represent a lasting testimony to the Ancient Egyptian civilisation. The Monuments of Ancient Egypt are not just restricted to it's more famous Pyramids and Sphinx, but to the 1000's of Temples and Tombs, and Archaeological sites from Aswan to Cairo. The legacy of Ancient Egypt can also been seen in it's Art and Sculpture, Literature and Hieroglyphs, as well as it's complex Religious beliefs on the Afterlife and in the abundance of Gods and Goddess. The Monuments of Ancient Egypt offers a tiny glimpse of the vast legacy of this great civilisation. The Temples and Tombs of Ancient Egypt gives a brief glimpse into the 1000's of Temples and Tombs, and Archaeological sites from Aswan to Cairo. It covers some of the lesser known and visted sites, as well as the more well known, such as the Valley of the Kings, Abu Simbel and the Temple of Hatshepsut. From the vast quantity of literature and heiroglyphs of Ancient Egypt, we are able to gain knowledge of their culture, religious beliefs, they left us everything from everyday lists of items, King Lists, stories and poems and of course, their Book of the Dead. No other ancient cultures Gods and Goddesses are quite so widely recognised, with literally 100's to choose from the Ancient Egyptians had a God or Goddess for every occasion. The legacy of Ancient Egypt can also been seen in the hundreds of 1000's of items Art, Jewellery, Artefacts and Sculpture. The craftsmen of Ancient Egypt left an abundance of Art for us to discover and enjoy, from the magnificent Golden Mask of Tutankhamun to the spectacular paintings and sculptures covering 3500 years of history. No other area causes as much speculation and imagination as the Religious beliefs of the Ancient Egyptians, with their multitude of Gods and Goddesses, and their seemingly obssesive fascination with preparing for the afterlife. There are over 100 pyramids in Egypt. Most were built as tombs for the country's Pharaohs and their consorts during the Old and Middle Kingdom periods. 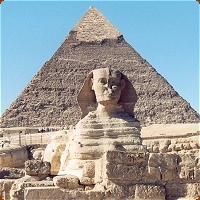 The earliest known Egyptian pyramid is the Pyramid of Djoser and the best known Egyptian pyramids are those found at Giza.